Home / Antonio Fatas / Lost decades: Italy 3 – Japan 0. The last decade has not been good for many advanced economies. The Global Financial Crisis, a second recession in the Euro area and central banks hitting the zero lower bound have led to disappointing GDP growth rates. But GDP growth rates can be a misleading indicator about the true performance of different economies. For example, as Matt O'Brien summarizes well, Japan has done much better than what most people believe. The confusion comes from the fact that there are two forces driving GDP growth. One is the number of hours we work and the other one is how productive those hours are. The absolute number of hours we work is a function of the population of a country. Because of that reason we usually measure GDP per capita growth instead of GDP growth. But this is not enough. Hours per capita can change in response to two forces. First, age matters. Typically engagement in the labor market declines with age, an aging country is likely to have fewer hours per capita. Second, the labor market. 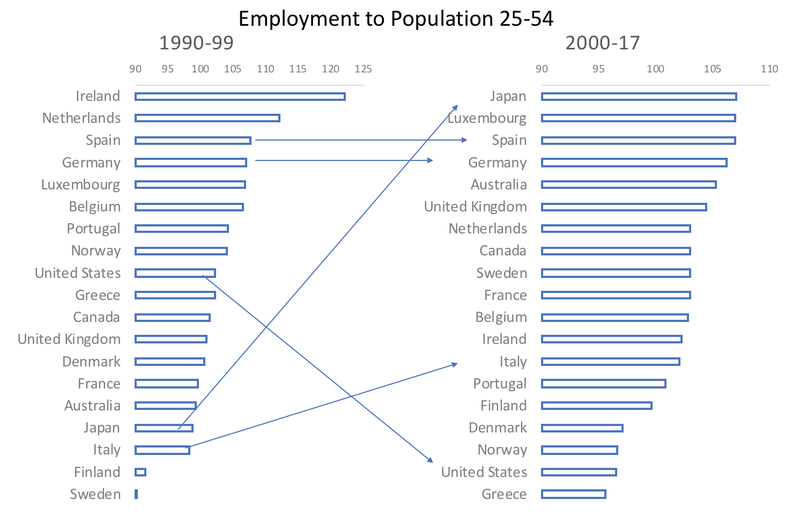 Even for groups of the population where labor market engagement should be the highest (prime-age workers) we see interesting variation over time and across countries that reflect on the performance of the labor market. Productivity, measured as GDP per hour worked. The labor market: measured as employment to population for the group of 25-54 years old. I am just leaving one factor out, which is aging (over which policy makers have little influence except for immigration policies or incentives to increase fertility rates). Using data from the Conference Board (for productivity) and OECD (for labor market), I have compared the performance of a sample of advanced economies for two periods. 1999-99, which happens to be a pre-Euro period, and 2000-17. All the numbers are expressed as the value achieved by the variable in the last year as compared to the initial year which is made equal to 100. So an index of 110 means that in the whole period, that variable grew by 10%. Two caveats: I am measuring performance ignoring initial levels. A country with a very high employment rate is unlikely to increase that rate over time so its performance would seem disappointing. Second, this is about relative performance. Compared to the other advanced economies, how did a particular country perform? We start with productivity (click for a larger image). Japan does well on both periods. The 4th best performer in the 90s and the 6th one since then. The US climbs up in the post-2000 period ranking. Among the Euro members, Germany loses a few positions with the Euro, same as France, although the change in ranking is smaller. Among the Southern European members, different fortunes. Spain seems to benefit from the Euro membership while Italy and Greece drop to the lowest positions, from already a very low level. For these two countries, performance has been low since 1990 and it got worse since the introduction of the Euro. There are some countries like the Netherlands that are towards the bottom in both tables. 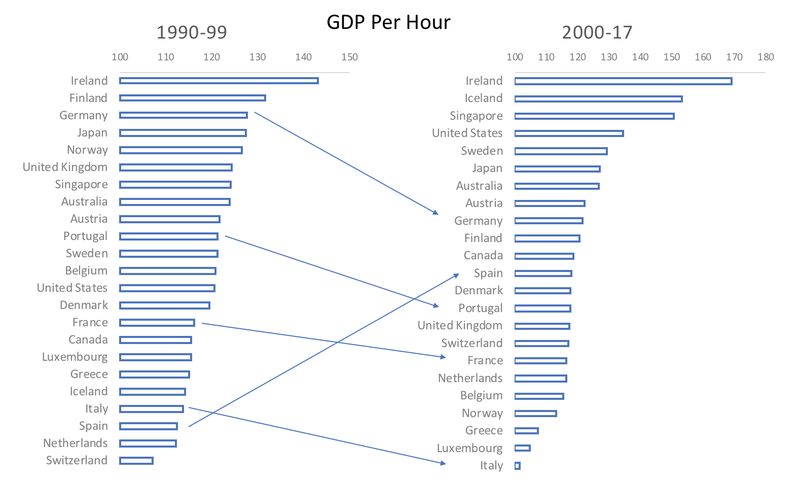 But the Netherlands has one of the highest GDP per hour levels among these countries so it is natural that its growth rate is low. That's not true for Greece or Italy that remain as two of the countries with the lowest GDP per hour level. What about the labor market? I focus on prime-age workers so that we cannot ignore issues related to aging and effective retirement age. Here Japan is a low performer in the 1990s but then it becomes the best performer in terms of improvements in labor market outcomes for this group. Some of this is related to Abe's policies in particular the increase the female labor force participation. Some Euro members are strong on both periods (Germany and Spain). Italy manages to improve its relative performance in this period although remains in the lower part of the table. Greece, on the other hand, and as a reflection of the large effects of the crisis, becomes the worst performer since the Euro was launched. And, interestingly,the US falls to the bottom of the table in the post-2000 period. While productivity-wise the US has done well since the year 2000, the labor market has underperformed relative to the other advanced economies. The UK labor market does well in the post-2000 period and partially compensates for its average productivity performance. Once the effect of an aging population is removed, Japan has done very well since 1990. It has sustained a good productivity growth while becoming a leader in terms of labor market outcomes in the post 2000 years. No lost decades despite a deflationary environment. Southern Europe has not followed a unique trajectory after the introduction of the Euro. Spain has improved its productivity while maintaining significant improvements in the labor market. Italy was a low performer in the 1990s and since the launch of the Euro its productivity performance declined while its small improvement in the labor market could not do enough to compensate. Italy stands out among the largest advanced economies because performance on all dimensions is low across all decades and this is more remarkable if we consider that both in terms of productivity and in terms of labor markets, its initial level was already relatively low. The US has seen a relative improvement in productivity while the labor market has deteriorated at a rate that only Greece can match. Previous It’s a (low inflation) trap! Next Is the Great Moderation back?